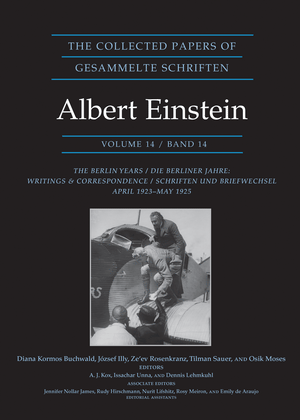 Princeton University Press is pleased to announce that Volume 14 of The Collected Papers of Albert Einstein (The Berlin Years: Writings & Correspondence, April 1923–May 1925) is now available for access through The Digital Einstein Papers. The latest volume in the series shows Einstein fleeing from Germany in the wake of threats on his life while pondering a unified theory of gravitational and electromagnetic fields. Those who delve into this digital edition will discover more than one thousand letters and several dozen writings, covering the years immediately before the final formulation of the new quantum mechanics. The discovery of the Compton effect in 1923 vindicates Einstein's light quantum hypothesis. Niels Bohr still criticizes Einstein's conception of light quanta and advances an alternative theory, but Walther Bothe and Hans Geiger perform a difficult experiment that decides in favor of Einstein's theory. At the same time, Satyendra Nath Bose sends a new quantum theoretical derivation of Planck's radiation law to Einstein, who then applies it to the ideal gas and predicts what is now known as Bose-Einstein condensation. Volume 14 also documents his collaborative preoccupation with a large number of new experiments designed to test these subjects, as well as an entire series of theories and proposed observations meant to interrogate what he called the "electromagnetic bookkeeping" of the Earth. These latter ideas were part of his ongoing attempts to formulate a unified theory of the gravitational and electromagnetic fields. The papers capture personal, political, and tumultuous events during this period. In early November 1923, on the eve of Hitler's beer-hall putsch, Einstein flees overnight to the Netherlands in the wake of threats on his life and anti-Semitic rioting in Berlin. He rejoins the International Committee on Intellectual Cooperation in June 1924, and supports the idea of a European union. He joins the board of governors of Hebrew University, which opens in April 1925, and celebrates the event in Buenos Aires while on a seven-week lecture tour of Argentina, Uruguay, and Brazil. He delivers lectures, meets with heads of state, visits major institutions, and attends receptions hosted by the local Jewish and German communities. He has a serious, but short-lived, falling out with his son Hans Albert and his first wife Mileva Marić-Einstein over how to invest part of the Nobel Prize money and he rescues his sister Maja and her husband from debt on their house. Einstein has a fourteen-month romantic relationship with his secretary, Betty Neumann, which he ends in October 1924. At the California Institute of Technology, Diana Kormos Buchwald is professor of history; József Illy, Ze'ev Rosenkranz, and Tilman Sauer are editors and senior researchers in history; and Osik Moses is associate editor. Read more about the series at http://press.princeton.edu/catalogs/series/title/collected-papers-of-albert-einstein.html. This volume is available in hardcover at http://press.princeton.edu/titles/10366.html.